Take a look at these two gems that I bought today (attachment added). The top item is in inverse colours to the bottom item (unit of 11). These are SAR+H Sick Fund stamps. Can anybody come forward with a theory why they were used and how the rates were worked out? 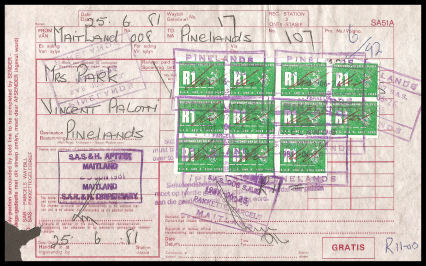 Many unions used stamps which were issued to employees weekly to cover sick funds, holiday pay etc. it was like a receipt. Till a few years ago the Building Industry also used the same method. Stamps were issued to different levels such as labourer, artisan etc in different values. In fact the SAR & H had different unions for different and specific classes and job descriptions. I worked as an auditor some years ago and used to audit one of their unions. I remember those stamps well. Sorry will explain a little how they worked. Each employee would have a card with a block for each week, you would stick your weekly stamp on which meant u were upto date with your fund. If your stamps were up to date and you got sick, the union would pay your wages for the period you were off. In some cases such as the building industry workers got sick pay, medical aid, pension and their holiday pay paid into stamp funds. A very sincere thanks for this information. I have had more than one theory about these stamps. Yours are totally different and it is obvious that you know what you are talking about. I trust that you will allow me to quote your posts in possible future discussions on this subject. On the other hand, I forgot to mention / show that the stamps I own were used on waybills (please see attached scan). Why were they used in this manner? At the bottom of the waybill and in a block is the word “GRATIS”. Obviously this means that the parcel sent with the waybill was not to attract a shipment fee? Hoping to receive more more information from you! My theory on them being used on a waybill could be simple if you look at the waybill the address is "vincent palotti" which is a hospital. Being sick fund stamps perhaps the employee was behind with his stamps and had to send them there to show his card up to date in order to get medical benefits.